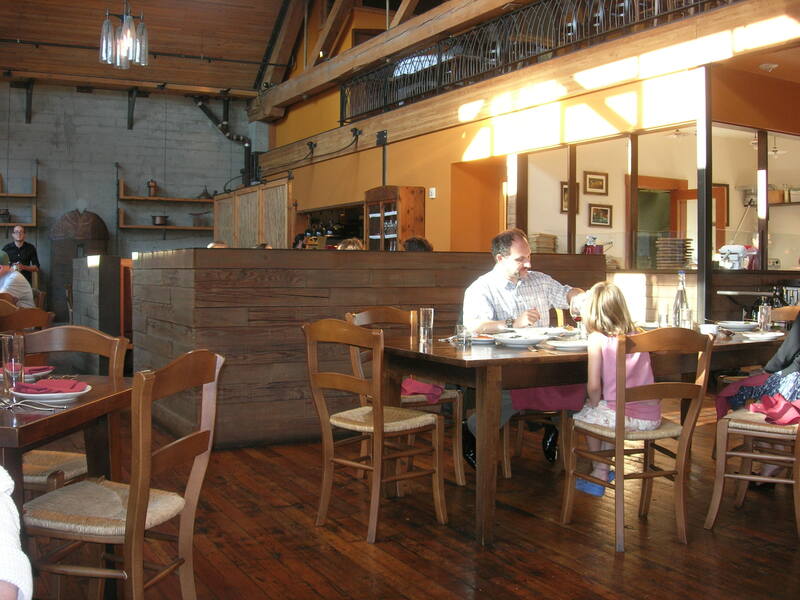 Osteria La Spiga lives comfortably at the intersection of Old World and New –the menu, with accents of the authentic culinary traditions of Emilia-Romagna, is presented in a setting that speaks a contemporary Northwest dialect of polished wood, exposed brick, and structural steel. The expansive dining room resolves into more intimate settings defined by beams, glass, textures, booths and “cubicles.” In rustic counterpoint, a weathered Italian sideboard anchors the service area, reminding you that the preparation of your meal actually began many years ago in the old kitchens of Emilia-Romagna. And the food is as appealing as the setting. Last Sunday, a friend and I had a lovely dinner there. Soon after you are seated, a basket of homemade flat bread arrives: a dense chewy bread, Piadina (the menu tells me) is vegan. You can eat it plain (as we did) or dress it with olive oil (you have a choice of two! ), balsamic vinegar, or truffle oil (ordered a la carte). 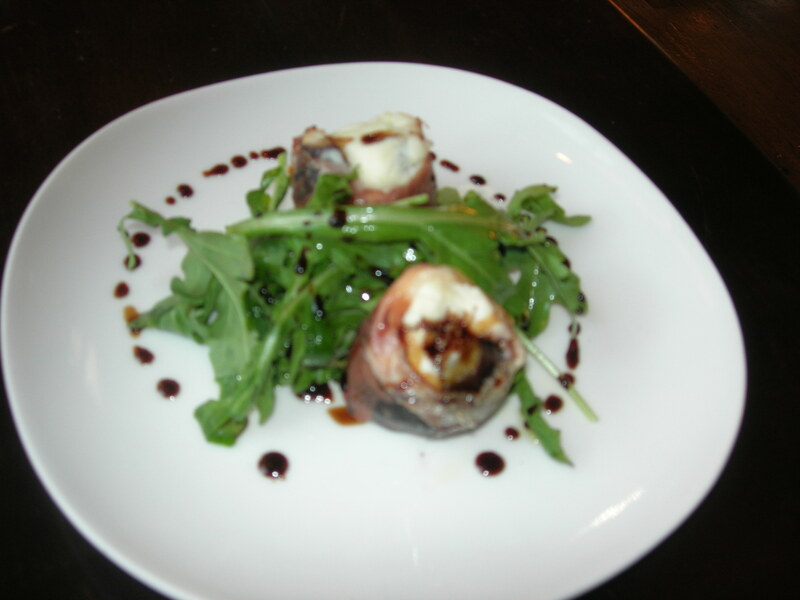 For the antipasto , we had prosciutto-wrapped figs filled with mascarpone and drizzled with saba (a grape must syrup), served with arugula from the chef’s garden. The plate was dotted with a nice reduction of balsamic vinegar, and the figs were sweet-savory, with a pleasing mix of textures. I love arugula; this version was young enough for only a hint of pepper beneath its smoke, and the dressing was light enough to let the flavors through. We came hungry!–we ordered two primi. 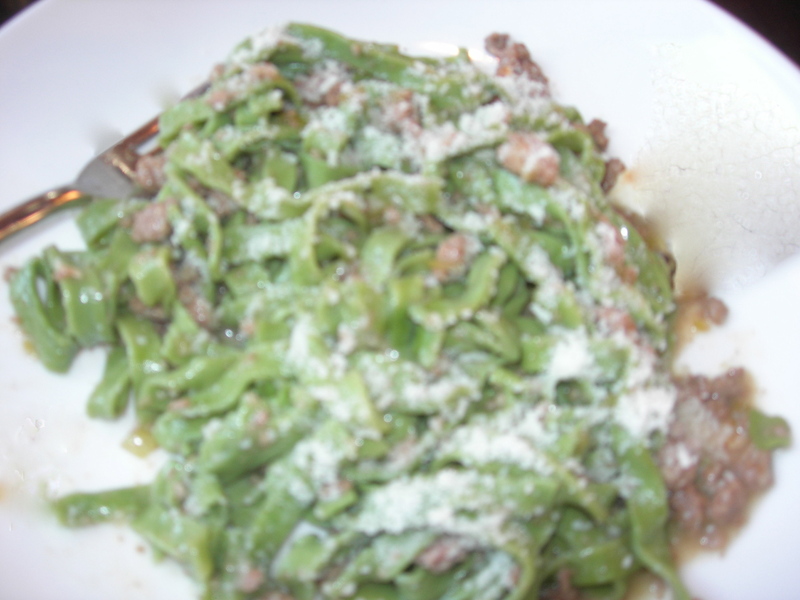 I went with the Tagliatelle Verdi al Cinghiale: green tagliatelle with a wild boar and white wine ragu. It wasn’t an easy choice. On my last visit, a friend had the Tagliatelle al Burro di Tartufo (tagliatelle noodles with white Alba Truffle butter), and I sneaked a taste–a lovely, rich sauce. But I’m glad I tried the boar ragu; the ground meat was delicate but added a distinctive earthy note to the wine sauce. You want to pay attention to this pasta! It is hand-made daily on-site. 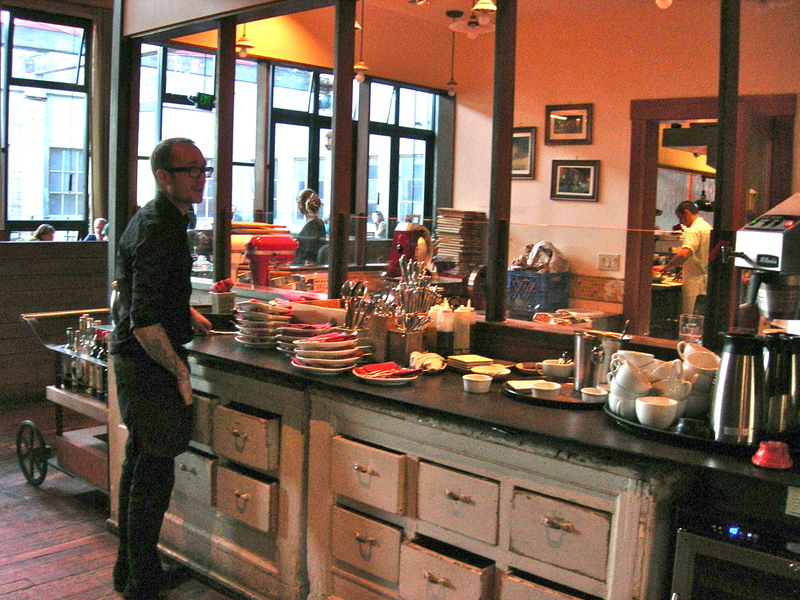 (You can watch; the pasta room, behind the sideboard, has glass walls.) If you are like me, you usually cook with dried commercial pasta, which has a uniform texture and thickness and bland taste. Say hello to pasta with character!–This pasta has a rustic shape and texture that holds the sauce in a very different and satisfying way. For the other “first,” my friend had the Gnocchi al Pomodoro: potato dumplings tossed in the house tomato sauce and Parmigiano Reggiano. I had this dish last time and loved it. 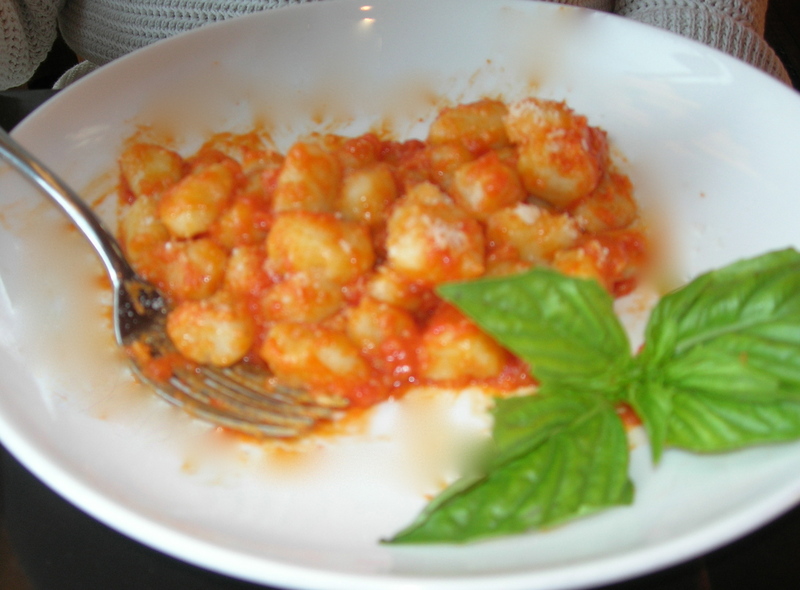 The gnocchi are very light, and the tomato sauce is absolutely to die for–delicate, aromatic, flavorful. We shared a single order of the porchetta (slow roasted pork shoulder with rosemary, sage and fennel seed served with fennel alla Parmigiana). The plating under-sells this wonderful dish; even a sprig of parsley would have brightened the presentation. But don’t be deceived; you are about to taste a dish that is anything but bland. The first clue was that it was served with a spoon. After having roasted low and slow over-night, the meat fell apart into moist chunks at the first touch. 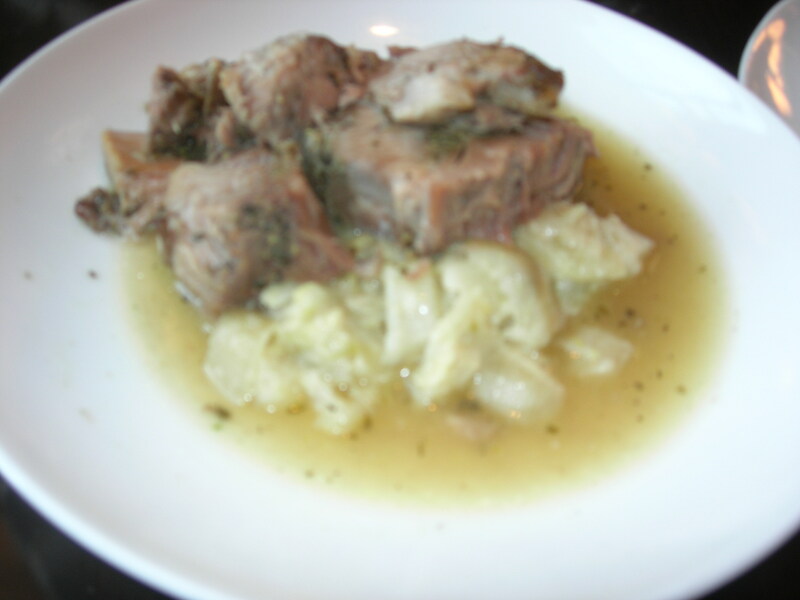 I would have told you that fennel wasn’t among my favorites, but the fennel seed and mild braised fennel worked like a wonder with the flavor of the pork. (I couldn’t get enough! Unfortunately, it is bad manners to stab your table-mate’s hand, so I had to make do with my half.) 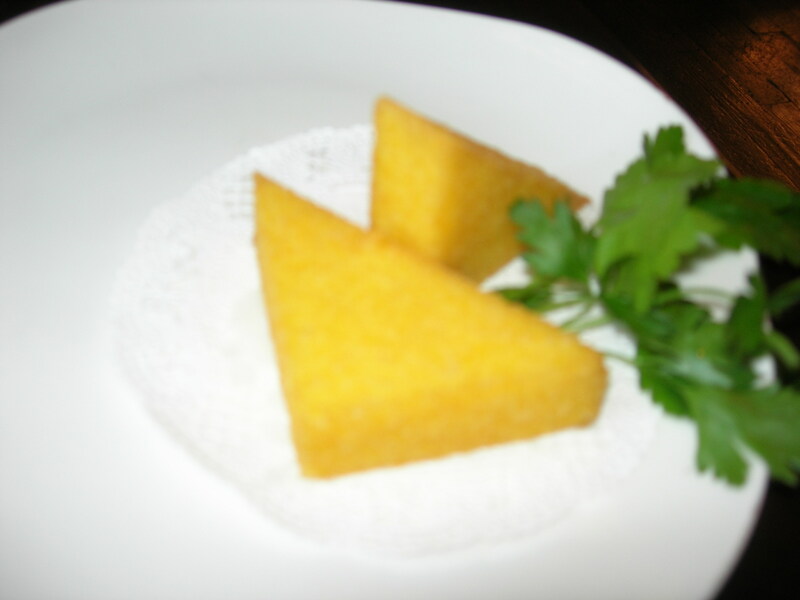 We rounded out our meal with a serving of Polenta Fritta: fried polenta wedges with a thin crisp skin over a light creamy interior. Classic! 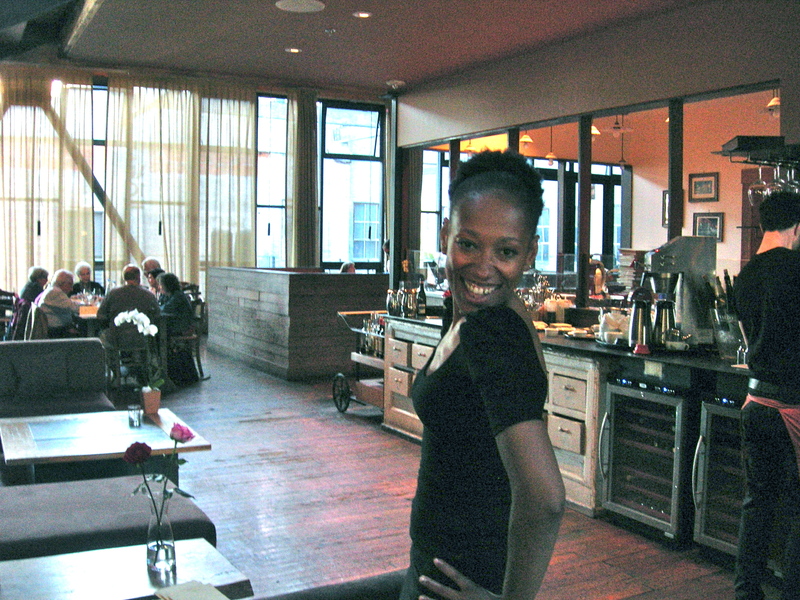 Here’s Darliene, who was maitre ‘d this evening (vamping for the camera–you go, Darliene!) And here’s my stepson Ezra, the floor manager, who was bartending on Sunday. (I couldn’t get a money shot of him–he wouldn’t stay still!) For some reason (because I was totally focused on my plate?) I didn’t take a picture of our server Miranda. She did a very good job for us–unobtrusive but somehow there when we look around with a question. I’ve had dinner at La Spiga several times now, with various of my opinionated and outspoken foodie friends (you know who you are). The consensus is: great food and very good service. Does it help that Ezra is my stepson? 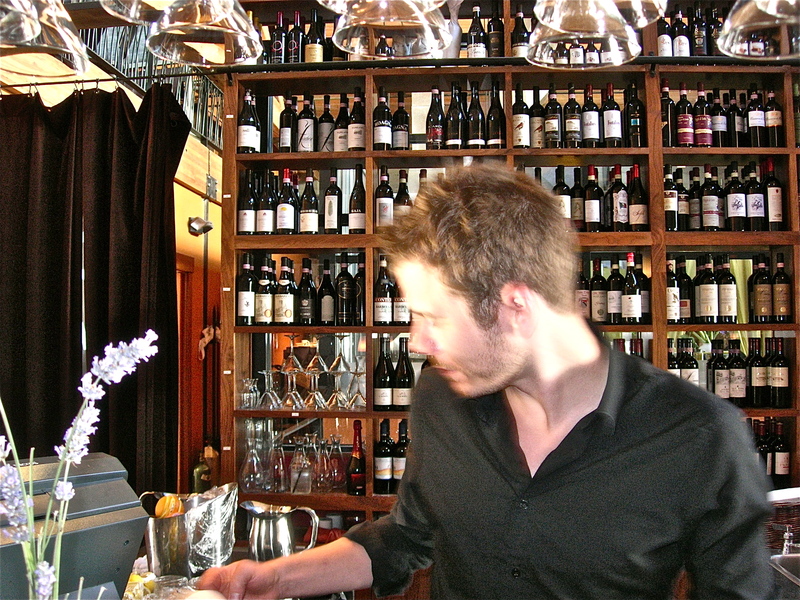 Probably!–but get acquainted with him and Darliene and the rest of the staff–they’ll take good care of you too. That’s the fun of having a place that draws you back again and again, where they welcome you every time. La Spiga, owned by Sabrina Tinsley and Pietro Borghesi, is on Capitol Hill in Seattle, on 12th Ave. between Pike and Union. http://www.laspiga,com. This entry was posted in Let's go EAT! and tagged arugula, cuisine of Emilia Romagna, fried polenta, gnocchi al pomodoro, handmade pasta, La Spiga, porchetta, prosciutto-wrapped figs, restaurant review La Spiga, tagliatelle with truffle butter, vin santo, wild boar sauce by judyramey. Bookmark the permalink.